Bookings on this photo tour are limited. Place your deposit online to secure your spot instantly. a lifetime trip to capture the Aurora Borealis. 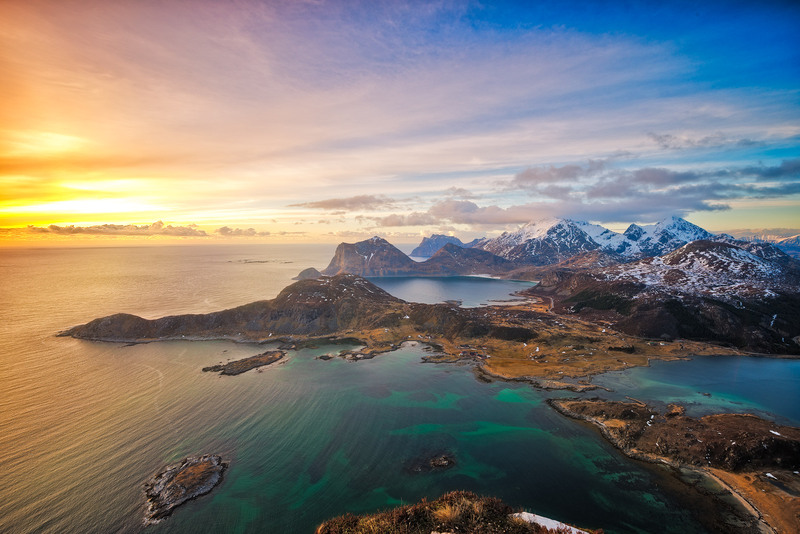 Lofoten is an archipelago and a traditional district in the county of Nordland Norway, and is known for it’s distinctive scenery with dramatic mountain peaks, sheltered bays, beaches and untouched wilderness. Join Rod Thomas on this 7 day adventure into one of the most photogenic places on earth during what is considered the absolute best time to visit this region. 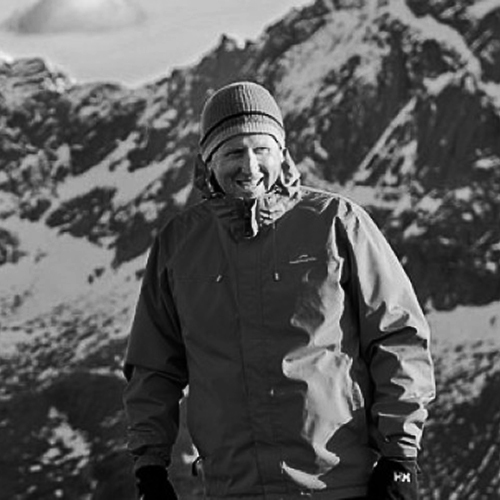 Join Rod Thomas on this 7 day adventure into one of the most photogenic places on earth during a warmer time of year. The weather can change very quickly in Norway, we recommend warm clothing but as always in these places layers are best. Good quality snow jacket and pants. Layering your clothing is best. Warm and waterproof would be best. Our first 4 nights of the trip are spent at the beautiful Eliassen Rorbuer. Located on the waters edge in Hamnøy, our cabins are just a short drive from the picturesque village of Reine and the perfect base to explore this area of Lofoten. We will leave each days itinerary fairly open and decide shooting locations on a day to day basis. Locations include, but not limited to Reine, Hamnøy, Flakstad, Skagsanden and Å. We have secured one of the best private house accommodations in all of Lofoten for our next three nights. The Lofoten Guest House is located about 10 minutes from Leknes and is THE perfect location for our activites in this area. 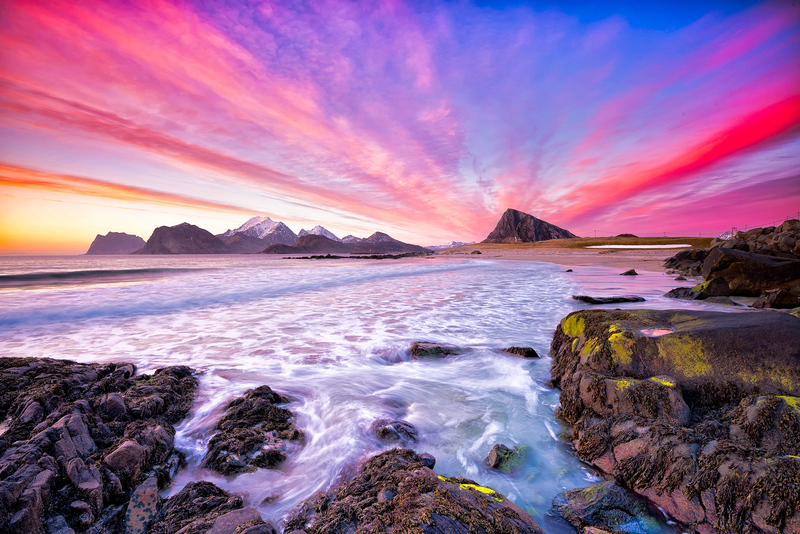 The beaches of Unstad, Utakleiv and Haukland are just a short drive away, and we could easily visit Svolvær and beyond from here if we decide to. Anne Gerds hospitality is second to none and I love bringing our guests here. Today we make our way back towards Oslo after an amazing week on Lofoten. I highly recommend the Radison Blu Oslo Airport motel given its location to Oslo Airport.. plus the breakfast there is pretty nice as well. Services of a professional photographic tour mentor, photographic tuition and workshops (suitable for any levels or ability). Internal travel and transfers. Minimum 4-star accommodation with private bathrooms on twin share / double basis. All meals are included (breakfast, lunch, dinner). Flights from Australia to Norway & flights from Norway to Australia. Alcohol, extra drinks, room service, laundry etc Gifts, souvenirs and any extras purchased. Travel insurance – a compulsory condition of booking. Camera or other optional insurances are not included. Meals. As we will all be out shooting at various times, I suggest we just visit the local stores and get what we need and cook together. People’s diets are varied, so we will be flexible with meals.